Can you tell the difference between Aloe and Haworthia? 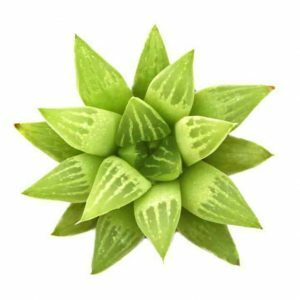 Even experienced succulent lovers can become confused when asked to confidently and positively identify a plant as either Aloe or Haworthia. At first glance, these spiky, green succulents can look like different varieties of the same species, but there are a few key characteristics to look out for. At one time, they were considered to be close relatives, due to their similarities in appearance, but as botanists have learned more about them, they’ve divided the two into different genera. However, they are related closely enough that they can be crossbred to create hybrid succulents. Unless you know the features to look out for, telling the difference between these two plants can be nearly impossible. Both plants can be similar in appearance and typically require similar care. 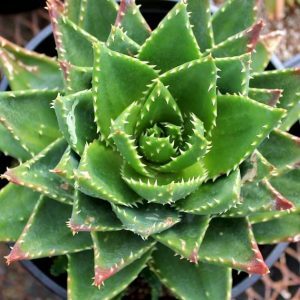 Both Aloe and Haworthia are native to Southern Africa and have triangular-shaped leaves in various shades of green. The patterns on the leaves can also add to the confusion. Depending on the species, the leaves may be a solid color, or they may be striped or mottled. Both Aloe and Haworthia come in a variety of patterns, so this is not an accurate way to differentiate them. 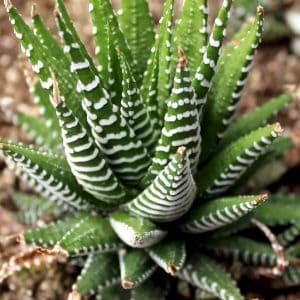 This Haworthia Fasciata from Mountain Crest Gardens can easily be mistaken for an Aloe if you don’t know the features to look out for. Both plants also have a habit of turning different colors when they are kept in stressful environments. Their leaves may yellow or turn brown if they aren’t receiving the proper amount of sunlight. The leaves will change from their normally healthy green color if the plant is receiving too much sun, but they will also become discolored if the plant is not receiving enough light. Both Aloe and Haworthia, like most succulents, do best with infrequent but deep watering. To prevent the roots from rotting, the soil must be allowed to dry completely before being watered again. As with many succulents, overwatering must be avoided to maintain a healthy plant. Neither of these plants are particularly difficult to propagate. Healthy plants of both species will produce offsets, or pups, which can be cut off and placed in another container to take root. Even relatively inexperienced gardeners can successfully grow both Aloe and Haworthia using this method. To add to the confusion, Aloe and Haworthia can be hybridized. These hybrids are sometimes known as Alworthia and are rising in popularity with fans of hybrid succulents. Hybrids are usually created with the idea of combining the best features of both species. Unfortunately, it can make the identification of such plants a little difficult. The most popular hybrid is a cross between Aloe speciosa and Haworthia cymbiformis. Commonly referred to as Black Gems, the leaves of these succulents can vary in color from vibrant green to deep reddish-purple. As you might expect, the leaves are thick and triangular in shape and the plant produces many offsets, usually in a large clump. Haworthia, such as this Haworthia retusa from Leaf and Clay, tend to stay quite small compared to most Aloe. One of the most notable differences between Aloe and Haworthia is the size. 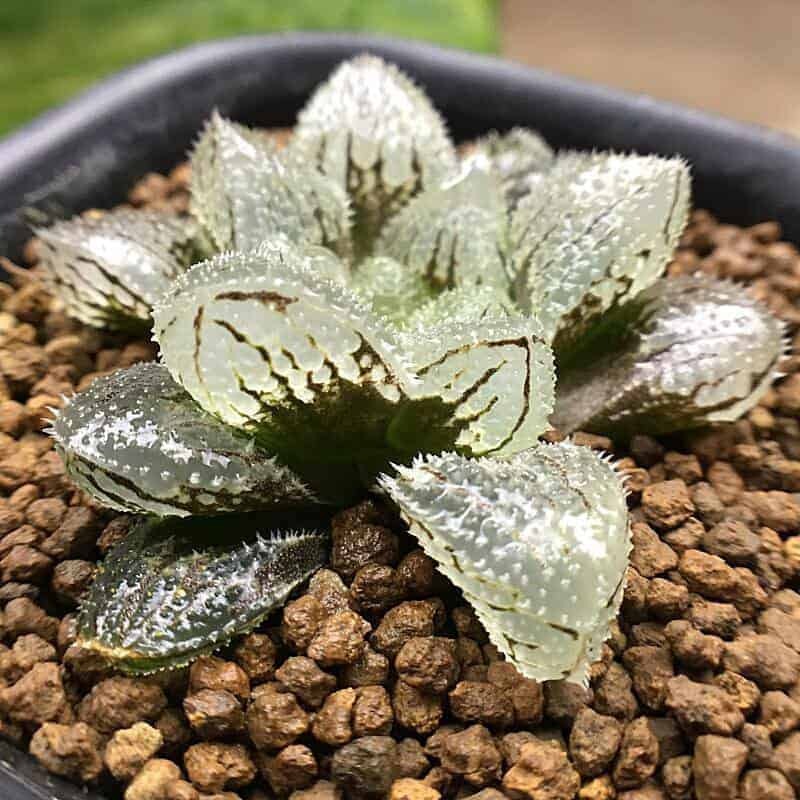 At maturity, Haworthia tend to stay quite small, usually just a few inches in diameter, but some species can grow rosettes up to 12 inches in diameter. As houseplants, they make great container plants and you can often fit several Haworthia into one container, creating a lovely succulent arrangement. The rosettes of Haworthia also tend to be somewhat compact. Aloe on the other hand, can grow much larger. Many species can reach several feet in both height and diameter. However, there are a few species of Aloe that are arborescent, meaning their long stem gives them a tree-like appearance. Some can even grow up to 30 to 40 feet tall! Some species can also appear stemless, but their leaves are often long and reaching compared to those of Haworthia. Depending on the species and the climate, Aloe can thrive either in containers or planted in the ground. While you can’t use this method year-round, the flowers of blooming Aloe and Haworthia are another easy way to tell the difference between the two. It may take some time for the plant to bloom, but once it does you should have a definite identification for your plant. Haworthia flowers tend to be quite petite and are always white in color. Depending on the individual species, they may also have small green or brown striations. They are somewhat tubular with wide, open ends. The flowers of Aloe plants, however, are generally larger and more tubular in shape than those of Haworthia. Although they are sometimes white, they also come in a variety of other colors, depending on the individual species. Aloe flowers can be red, yellow, orange, pink, or some combination of these shades. If you have colorful flowers, you can be certain the plant is an Aloe. You can identify this Gold Tooth Aloe from Mountain Crest Gardens by the spiky teeth along the leaf margins. Perhaps the best way to determine whether a plant is an Aloe or Haworthia is to check for teeth along the leaf margins. If the teeth are not obvious, you can try running your finger along the edge of the leaf. 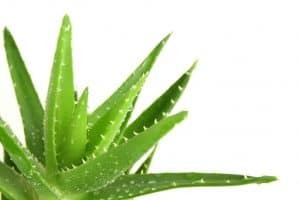 If you feel small, rough spikes or teeth, the plant is an Aloe. The teeth are not particularly sharp, like cacti, but be sure to touch the plant gently nonetheless. Haworthia do not have teeth along the margins. If you run your finger along the leaf’s edge and it feels smooth, the plant is most likely a Haworthia. 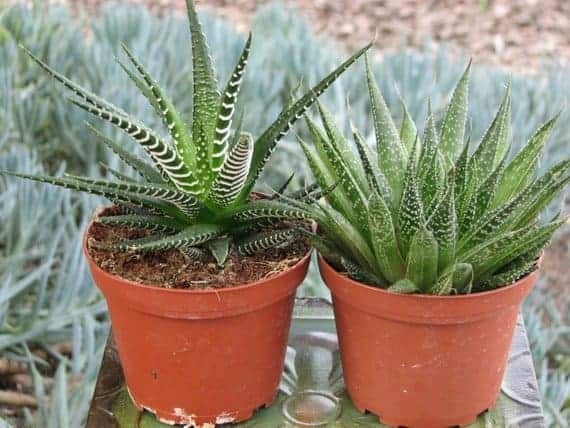 There are a few varieties of Aloe, however, that do not have margin teeth, but those species tend to have other features that distinguish them from Haworthia, such as size. Some species of Aloe may also not have teeth around the entire margin of the leaf, but if you see teeth at any point on the leaf margin, you can be sure that you’re looking at an Aloe (or maybe an Agave, but that’s a topic for another time). Now that you’re an expert in plant identification, you can go ask your local nursery if they have any unlabeled plants they need help with to see if you can tell the difference between Aloe and Haworthia. If you’re not certain, you could be looking at an Aloe x Haworthia hybrid! What’s the Difference Between Cacti and Succulents?